Brett Davidson and Dr Sarah Chaplin along with our children, Ted and Maisie, welcome you to have a look at our web site. Mount Major Murray Greys is situated in a picturesque setting, 8 km north of Dookie, with views of Mount Major. Our stud is founded on bloodlines from Dajory, Lindsay, Willalooka, Mount View, The Glen and Monterey. Through the use of these elite genetics we aim to provide high indexing animals with low birth weights. We want to provide quiet, well-handled bulls that will produce soft, well muscled, thick, meaty calves for our clients. At Mount Major we have built up our herd into one that has outstanding type and performance, producing industry leading the cattle that perform in the paddock. We are thrilled with our lastest herd EBV's which show that we have improved all carcass trait indexes, rib and rump fats, EMA, carcass weight, growth and now our IMF is a massive 0.7% for the whole herd, and our EBVs for EMA are now almost double breed average . We have lowered birth weight and calving ease. All our herd sires have indexes in the top 1% of the breed, and our entire 2015 drop was in the top 10% of the breed and over half in the top in the top 5%. We feel very proud that our breeding goals are coming to fruition. We have been recording with Breedplan since we started our stud and scan all our cattle for carcass traits, and have implemented Breedplan accredited structural scoring for all animals. This will enable increased scutiny on animals retained and sold for breeding and will increase the value and productivity of our animals for our clients. Health testing is also a high priority with genetic testing regularly carried out: all animals are currently free from all known genetic disorders. We are also in the BJD MAP program and our status is currently MN3. Sarah and I are actively involved in agricultural research and extension. 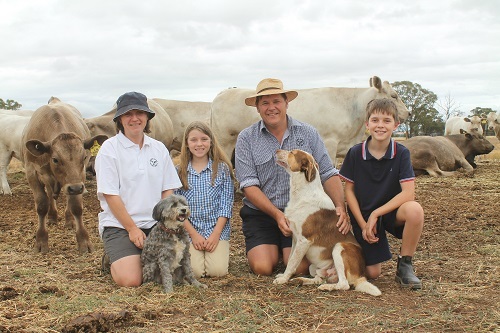 Sarah is on the Dookie Show Committee and Davo is the Victorian representative and Treasurer of the Board of the Murray Grey Beef Cattle Society. Sarah has a PhD in animal behaviour and welfare and works for Agriculture Victoria as Development Specialist for Animal Performance. Davo has a Bachelor of Agriculture from Dookie College and also works for Agriculture Victoria as Regional Manager for the dairy extension team in Northern Victoria. Ted and Maisie both own cows in the herd and help with jobs around the farm.